Why can’t King Quest satellite dishes get HD on DIRECTV? Actually, they can. It’s just that there aren’t any HD channels to get. Let me back up a little bit. 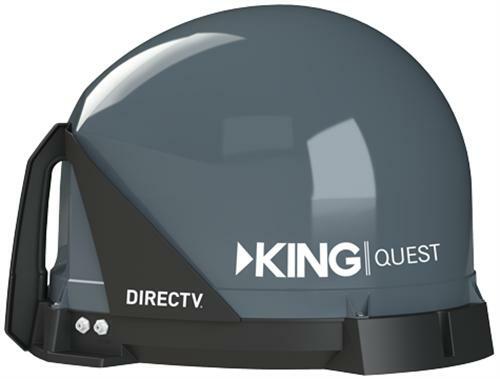 The King Quest Automatic Satellite System gives you satellite TV almost anywhere. Just put it on a level surface with a clear view of the southern sky and it will do the rest. There’s only one problem though… you’ll only get standard definition channels. A lot of people will tell you that the dish can only see the 101 satellite, and that’s not exactly true. DIRECTV uses two different sets of frequencies for satellite transmissions. One, the “Ku band,” is the same set of frequencies used by satellite TV operators all over the world, including DISH. The other, the “Ka band,” between 26.5 and 40GHz, is only used by DIRECTV in North America. No one else has any licenses for it. While this means virtually limitless capacity for HD and 4K channels, it also means that instead of off-the-shelf parts, a DIRECTV satellite dish needs special receiving equipment. On regular dishes something like the Slimline-5 SWM LNB is used which gives one dish the ability to receive Ku-band broadcasts from three locations and Ka-band broadcasts from two others. It even packages all that signal up into a nice tidy chunk of frequencies that can all fit on one wire. For mobile dishes, that big thing wouldn’t fit and it wouldn’t focus the signals the way it needs to. In order to receive DIRECTV HD broadcasts, which are on the Ka band, custom hardware is needed. Custom hardware is expensive, and at the moment none of the makers of mobile and marine antennas are spending that money. At the very least you would need a custom Ka-band tuner chip, and if you only had that you would lose SD channels (potentially not a big deal.) If you wanted it all, you’d need a custom-made setup like that SWM LNB but smaller and designed to work with a smaller dish. All that costs a lot of money and especially with a lower-priced unit like the King Quest, it would change the price a lot. Or it’s possible that’s the end of your investment. I doubt that very much, but anything could happen. If you have a mobile or marine dish that only gets standard definition channels, call your friends at Solid Signal at 877.312.4547 to discuss your options. Right now no one knows what the future will bring, but if you want to be 100% future proof there are certainly options out there! What is a pitch pad and why would you use one?